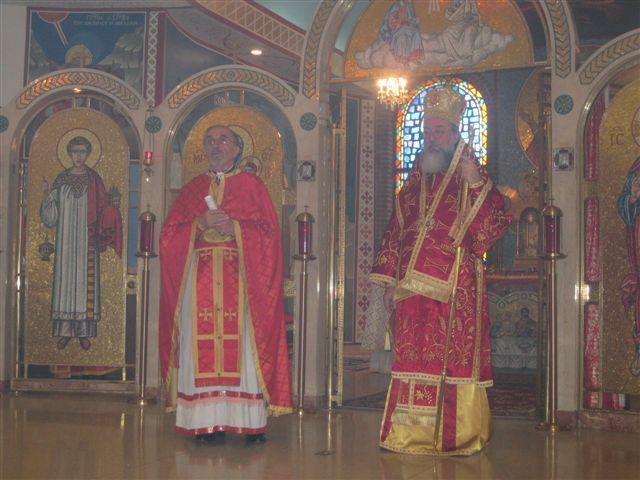 Joliet, IL – On the twenty-second Sunday after Pentecost, November 8, 2009, the feastday of St. Demetrios of Thesssaloniki, His Grace Bishop Longin of New Gracanica-Midwestern America, offiiciated at the Holy Hierarchical Divine Liturgy at the St. George Serbian Orthodox Church in Joliet, Illinois. Concelebrating were Fr. Nedeljko Lunich, the local priest, Fr. 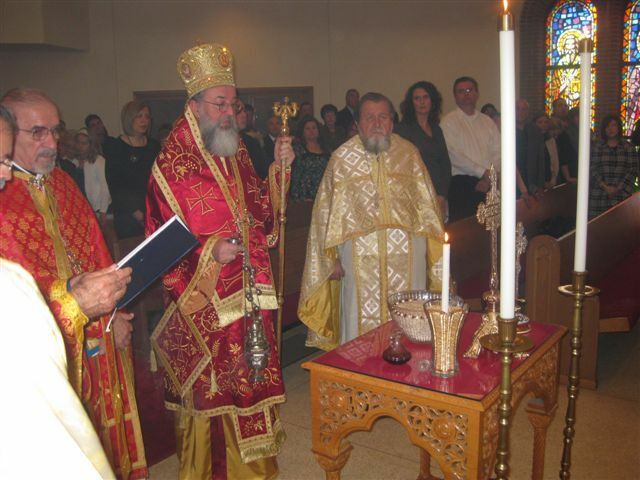 Lazar Kostur, retired priest from the Merrillville parish and Protodeacon Milovan Gogic. Assisting in the altar were Seminary graduates Nikolaj Kostur and Nenad Jakovljevic and Reader David Laketa, together with a group of altar boys. His Grace Bishop Longin homilized on the morning's gospel reading of the Rich Man and Lazarus, showing the path to salvation. 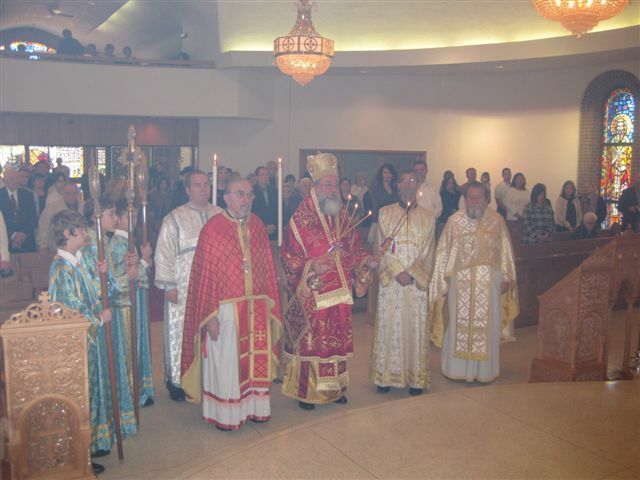 A Parastos was served following the Divine Liturgy for the deceased clergy and parishioners of St. George Church in Joliet. Singing the responses at the morning's Divine Liturgy and Parastos service was the “Sloboda” Choir from Lansing, IL since the prior evening the host choir “Mita Topalovich” held their annual choir concert with “Sloboda” as the honored guest choir. A banquet was held after the liturgy with some two hundred in attendance. The kitchen crew prepared a rich menu of foods to whom we are extremely grateful. Greetings to those attendance were extended by Nick Milanovich, President of the Church Board, Fr. Nedeljko Lunich, the host priest and the diocesan hierarch Bishop Longin. Presidents of the two choirs, Darlene Jovanovich and Bob Djakovic, also exchanged greetings. 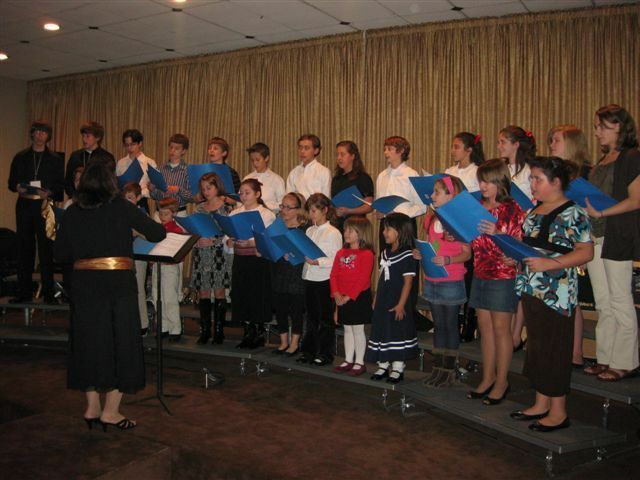 The St. George children's choir also participated in the extensive program as well as both the folkore and tambura groups. As this prayerful gathering came to an end it was met with the extreme satisfaction of both our hierarch and all in attendance. Following a short visit to parish home Bishop Longin, accompanied by Protodeacon Milovan Gogic, returned to his episcopal residence, the New Gracanica Monastery. The parish priest, Fr. Nedeljko Lunich, the church board and parishioners of the St. George Church are grateful to His Grace for his canonical visit and for his holy prayers. God grant you many years, Vladiko!